Why I Have No Sense of Humor About Arena Footing. I have no sense of humor about arena footing. None. Let me start here: I don’t consider a plowed up area in the pasture necessarily the same as an arena with footing. A plowed area is kind of like chocolate chip cookie dough, and an arena with footing should be more like lemon meringue pie. I’ve apparently failed to explain this clearly enough to the tractor guy I hired to spread 50 tons of sand. He left the sand 8″ deep on the center line and no sand at all on the rail. Given a chance to fix it- my base got disked up on the rail, and the center line got even deeper. Not rideable, but at least it was expensive. I am replacing the footing in the outdoor arena here at Infinity Farm. I started in February. It doesn’t have to be this difficult. Maybe I have bad contracting karma. Two years ago, I hired a trucker to haul in several loads of sand. Oddly, I can tell the difference between sand and fill dirt -with cans and wire and trash in it. I’m no doormat, I complained mightily. The trucker wore a denim shirt with the sleeves cut off- it might have fit him in high school. Ultimately, I realized he was the kind of man who probably had a hand gun and wouldn’t be afraid to use it on a loud-mouthed woman. I took the moral high ground and shut up. I suppose the good news, other than surviving the confrontation, is that fill dirt blows off quickly. In no time at all, I was hiring this current tractor guy, and hence, the reason I have no sense of humor about footing. When I am being a trainer/rider, I require good footing to keep my horse sound and comfortable. Not too deep, not too shallow. Just right for this particular horse and discipline. All I need is a compacted, level base with no pits or ruts, and good drainage. Some expensive, softer footing on top- it can’t be that hard… Bad footing is a good reason to move a horse, so I’m pretty humorless when it comes to needing a good working arena and it should be included in the high price paid for board. Finally, there’s the horse’s side. First, these large animals have proportionally tiny feet. Second, they were never designed to be ridden. Third, nothing else matters. Footing matters a lot to Magic, a very sweet Quarter Horse owned by a past client. Sure, he was a little down in front, with a long back and his toes turned in. He has a touch of arthritis and probably did more than his share of stumbling and tumbling in younger days. It’s a good reason to be cautious. But Magic is a great partner with alot to offer. He has the ability to glide effortlessly forward in good footing- a joy to ride. But uneven or slick footing makes him nervous, he loses balance and can even look three-legged lame. Magic has no sense of humor about footing either. 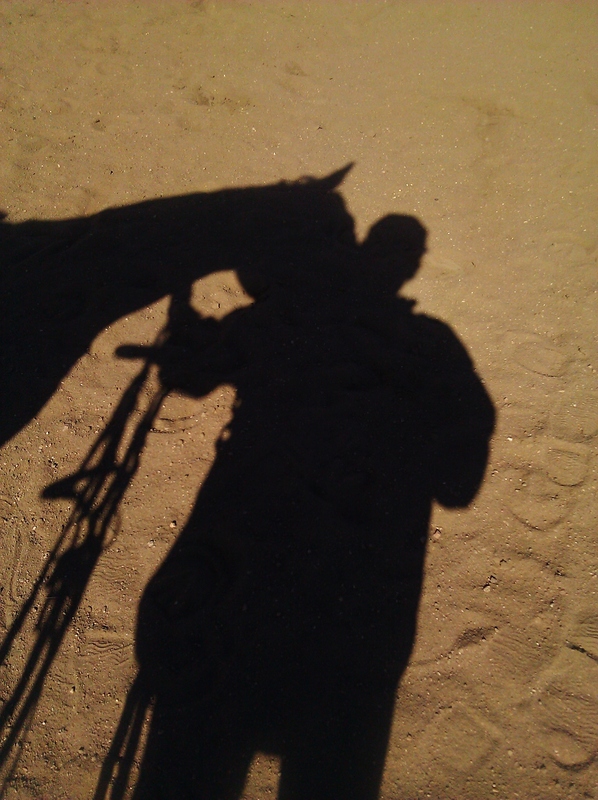 What is true for Magic is true for all horses, regardless of age or breed or physical condition. Confidence and balance are crucial for training to progress, and that starts under the hoof. Like any other athlete, a horse has to be able to trust the ground under his feet. Oh…footing has to be one of THE most frustrating things about facilities – for the person in charge of it, and the horses. Our poor barn owner contracted a professional footing installer, got a perfect base, the correct amount of sand evenly spread – only to find out a week later it wasn’t the beach-type sand she ordered and paid extra for, it was concrete sand. The kind that packs densely, amount other horse unfriendly attributes. Cost a fortune. She wets it to keep down dust, and we have something close to wet concrete. Lord help you if it dries in your horses hoof! Contractor insists its loose beach sand. Horse people know the difference. New she’s stuck trying to amend it, and not raise the board over the fiasco.